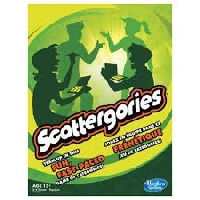 Scattergories are so much fun - not so hard that they're frustrating, but not so simple that they're boring! I've been hosting a postcard series of swaps based on Scattergories, and decided to bring back a more extended email version as well. For this swap, you'll complete a "Scattergories"-style game and share with your partners. You'll complete the list using words that start with your partner's Swap-bot user name's first initial. For example, my user name is HappyMom, so if I'm your partner, you'll come up with words for each category below using the letter "H". If my user name was 32Johnson, you'd use the letter "J" even though my ID starts with a number, since "J" is the first letter. Note-- if you happen to get a partner who's user name starts with a Q, X or Z, you may use the second letter! Answers must be in English please! You will have 2 partners, so you will have 2 lists to create. If you happen to get both partners with the same initial, you can repeat your answers. SEND EACH PARTNER HIS OR HER LIST SEPARATELY VIA EMAIL OR SWAP-BOT MESSAGE! Minimum rating 4.9 and no unresolved 1's or 3's. Newbies welcome with highly detailed profiles. I reserve the right to make exceptions and will angel any swap not received. Sign-up through August 25th, Partners assigned on August 26th and swaps due before September 9th. Please send on time and rate promptly. PS - If you like participating in email swaps, please check out the Electronic Swaps Group too! I think "U" is pretty hard, too - can my partner use "S" (the second letter)?